Here are examples of how individual Catholics experience their faith. To be a catholic means to follow Christ by the way we lead our lives, to abide by the Commandments we were given and to respect and treat our friends and neighbours and even strangers in the way Our Lord would have done. To accept with humility things don’t always go the way we want, saying a little prayer – ‘if it is His will not mine’ – we will see the way to go. We are given many chances to start afresh and so often we throw it back at Our Blessed Lord. But he never gives up, always gently chiding us to make the right choice.-:-My Christian faith is the bedrock of my life. I am comfortable in worshipping in other Christian churches so long as we are all trying to live out Christ’s teaching as I understand it; I find that formal worship, however occasional, gives me a necessary structure for the beliefs which underpin my life. Being a Christian means trying to emulate at least some of the message of Jesus Christ. This is best done within our own community and that of the church, which is wider. Jesus set an example of holy simplicity, mission, service, care and delegation. As Roman Catholics, we hold a Christian Faith that is Apostolic in origin, with an Episcopal hierarchy, presided over by the Pope. Our faith has the Eucharist at its core and we hold a belief in seven sacraments, and in the authority of tradition . We believe in the doctrine of The Holy Trinity, Father, Son and Holy Spirit, and that Mary, the mother of Jesus, was preserved from original sin from the moment of her conception . Our faith is summarised in both the Nicene and Apostles’ Credes which we recite together at Holy Mass . As a Christian I believe in Jesus Christ “who was conceived by the Holy Spirit, was born of the Virgin Mary, suffered under Pontius Pilate, was crucified, died and was buried; on the third day he rose again from the dead; he ascended into heaven”. Because of my faith, I feel called to do all within my power, abilities and resources to support the Christian community in which I find myself. Also I feel it is my duty to make myself available to my neighbour, whoever that may be, when needed and by so doing try to make people aware of my faith. Finally I believe we are all called to strive towards the goal of Christian unity so all may be one again. Each year thousands of adults choose to become Catholics. They come from different backgrounds for different reasons: Some are already Christians from other traditions attracted by the teaching of the Catholic Church and by the example of individual Catholics they know. Some are from another Faith or no Faith at all who have heard about Jesus, His claim to forgive sin and His promise of eternal life. Some are non-Catholics who have been coming regularly to Mass for years with their Catholic relatives. They wish now to become full members of the Church. Some have had no previous contact with the Church at all but have this inner calling to discover the truth about the most important questions of life. If any of the above situations applies to you, then please contact us. 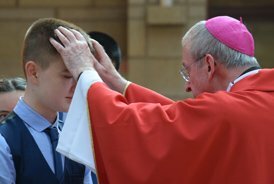 Most Catholics enter the Church through baptism as infants and receive the Eucharist and Reconciliation (First Communion and Confession) and Confirmation when young. 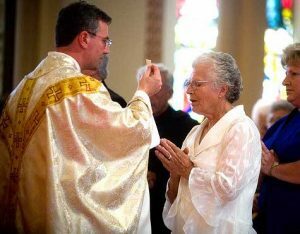 However, there are many people who become Catholics, or receive the Sacraments they have previously missed, later in life. There are also some Catholics who missed out on the Sacraments as children and also those Catholics who are feeling a bit ‘rusty’ in their knowledge of their Faith and who would like to learn more. Yes. All that is required is belief in God and the teachings of the Catholic Church founded by Jesus Christ. This should be borne out in our daily lives, eg by prayer, coming to Holy Mass every Sunday, living moral lives of truth and charity. If this isn’t entirely the case currently, then talking to Fr Michael or one of the deacons will be an opportunity to investigate further. All we ask is a willingness to explore in good faith and openness the call of Jesus to become more faithfully His disciple. There are lots of misunderstandings about what the Catholic Church actually believes and why. This is your chance to find out for yourself. I was brought up as a Christian in another denomination. Do I have to reject my past life? No – if it isn’t contrary to our Faith and morals. God has brought you to this point where you are considering becoming a Catholic. We rejoice in the Christian goodness and truth you have experienced elsewhere. People thinking about becoming Catholic can feel nervous. This is one of the most important decisions you can make, but you are not alone. Thousands of people across the country are doing the same thing. There are others in a similar situation with the same basic questions. Contact Father Michael Thomas and he will help you take that first step. There are seven sacraments which Christ instituted and entrusted to the Church. They are sacred signs of God’s presence and channels of grace to those who receive them with the proper disposition. Throughout our lives we celebrate the power of God through these life giving actions. The seven sacraments celebrate our initiation into God’s life (Baptism, Confirmation and Eucharist), God’s call (Marriage and Holy Orders) and God’s healing (Reconciliation and Anointing of the Sick).For adults who have not been initiated into the Catholic Church the sacraments are usually received after careful preparation. The sacrament of baptism forms the foundation of the sacramental life in the Church. It is the gateway to a life with Christ, being the first sacrament of Christian initiation. The three fold pouring of water in baptism symbolises the destruction of sin and a new life in Christ bestowed through the power of the Holy Spirit. 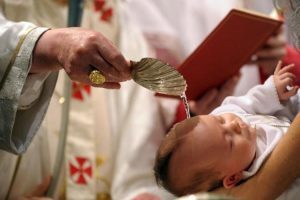 Through the sacrament of baptism the child becomes a member of the Church, hence the ideal time for the baptism of infants, is during the Sunday mass at which all Christ’s faithful are present. 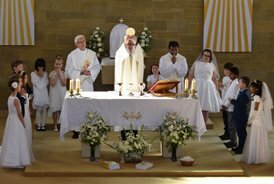 The parents of those to be baptised are asked to profess their faith and to accept the responsibility to raise their child in the Christian way of life. This presumes an active faith life and regular participation in the Sunday Eucharist. Parents are expected to participate in baptism preparation sessions prior to the baptism of their child. We celebrate the Rite of Enrolment within a Sunday mass at the start of the process, where they commit to participating fully in the program. It also makes the Parish community aware that the young people are preparing for the sacrament and encourages them to be active participants in the process. Nearer to Confirmation we have the Rite of Election for those who have decided they wish to be confirmed. All our young people have a sponsor. The sponsor provides a link for the young person with the Parish community as well as praying for the young person. A relationship is encouraged between sponsor and candidate by providing questions for the candidate to ask their sponsor throughout the preparation process. Sponsors may be the young person’s baptismal god parent or another confirmed, adult member of the community. They must, however, be able to meet with the young person on a regular basis. Parents, as the primary catechists of their children also need to be involved in the process. We have a ‘welcome’ session for parents and potential candidates prior to starting the process. This is usually a social event during which we explain the process to the parents and young people We have catechetical sessions for parents to remind them of aspects of their faith and to support them in developing the faith of their children. Children are prepared for their First Holy Communion once they have reached the age of reason. For most children this will be around the age of seven years old. Children usually participate in the sacrament of reconciliation at least twice during their preparation for First Holy Communion. Children are prepared in small groups with sessions carefully tailored to meet their individual needs. The Eucharist is at the heart of our parish life and Mass is usually celebrated everyday. We have regular times of adoration of the Blessed Sacrament throughout the week. Please see the Bulletin for details. Christ preached a message that calls each of us to reform our lives. We are called to conversion, from selfishness and sin, to love and holiness. 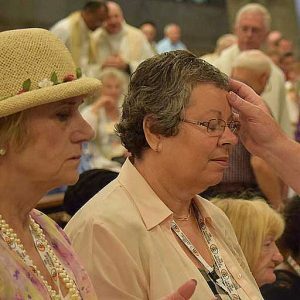 This journey of conversion to a fuller life in Christ, takes a life time and through the sacrament of reconciliation we are able to celebrate this ongoing conversion. Through this sacrament we are absolved of sin and reconciled to God. The sacrament of reconciliation, is available at Minehead on Saturday 4.30 – 4.50 pm and Dulverton on Sunday 8.30 – 9.15 am or at other times by making an appointment with Fr Michael. Scripture affirms that man and woman were made for each other. Marriage is a covenant by which a man and a woman establish between themselves a life long partnership, ordered to the good of the other and the procreation of children. In the Catholic Church the celebration of Marriage takes place during Mass. The husband and wife as ministers of Christ’s grace confer upon each other the sacrament by expressing their consent before the Church. The priest receives the consent of the spouses on behalf of the Church and gives the blessing of the Church. Sickness often presents a great challenge and reminds us of our human frailty. The sacrament of the sick strengthens us during these times and if necessary forgives us of our sins. The sacrament of the sick involves an anointing with holy oil and a prayer for healing. The priest is the minister of this sacrament. The priest or an extraordinary minister of Holy Communion may also visit a sick person to bring them Holy Communion. If you are interested in exploring a call to the priesthood or the permanent diaconate then please speak to Fr. Michael or contact the Clifton Diocese Vocations Director, Fr. Matt Anscombe. If you require further information on the sacraments or wish to arrange for a baptism, wedding or funeral in this parish, please contact Fr Michael.